As early as the 5th century, the rock paintings of Yinshan Mountains were found by Li Daoyuan, a geologist of the Northern Wei Dynasty. A detailed account of his findings was given in his renowned Work-Commentary on the Waterways Classic. 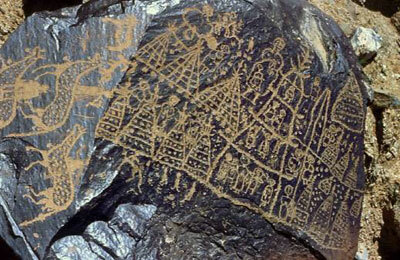 This is the earliest record of the rock paintings of Yinshan Mountains in the world. It was in 1976 that China started a comprehensive survey of the rock paintings. From then on, large numbers of experts, scholars and tourists have carried out studies of these paintings and paid visits to Bayannur League, more than ten thousand rock paintings have been discovered, and nearly one thousand of them have been photographed or copied. These rock paintings not only reflect the beliefs, aesthetic standards and world outlook of the ancient in habitations in Yinshan Mountains areas, but also present a truthful picture of their nomadic life. The rock paintings of Yinshan Mountains scatter over a wide area. The densest concentration is on the Heishan Mount of Dilihari Mountains to the south of Wulate Middle Banner, Bayannur League, Inner Mongolia, stretching over five kilometers from the east to the west. Over one thousand rock paintings can be found in this place alone. These rock paintings, together with the large numbers of rock paintings found on the southern hillside and the mountaintop not too far away to the northeast of the Dilihari Mount, constitute a concentration area of rock paintings. On the Wayaogou Northern Mount about 8 kilometers to the southwest of the Dilihari Mount, paintings can be found at the intervals of 2 meters, 10 meters or longer, amounting to a total number of more than 900 paintings. Next in density is the black rocks in the mountainous areas of North Tuolin Valley, Dengkou County, where rock paintings are found at the intervals of2-3meters ingeneral and 10 meters at the most, numbering more than 500 pieces in total. One of the two densest concentrations of rock painting group is a cliff facing the north in Molehetu Valley, with about 80 head portraits clustered within an area approximately 50 meters in width and 20meters in height. The other one is a cliff facing the west in the middle of Geheshangde Valley, consisting of 50 individual drawings within an area approximately 5 meters in width and 15 meters in height. The rock painting with the largest sizes the square painting drawn on the rocks by the western mouth of the Daba Valley, Urad Rear Banner, which covers an area of about 400 sq meters and ranks among the key preserved cultural relics of Inner Mongolia Autonomous Region. 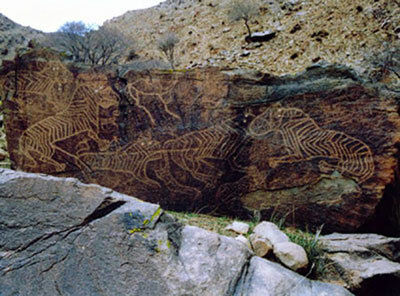 The themes of the rock paintings are in general the hunting activities of the nomadic nationalities. Among the rock paintings, the most numerous and most finely drawn ones are pictures of animals, including goats, sheep, argali, antelopes, blue sheep, elks, white-lipped deer, cervus elaphus, David's deer, moose (also known as han da an), roe deer, horses, mules, donkeys, camels, oxen, wild oxen, takins, dogs, turtles, wild boars, rabbits, foxes, snakes, wolves, tigers and leopards, etc. Scenes of hunting, with their considerable amounts and representation of the social life of the prehistoric nationalities, also hold a special position and constitute the most magnificent part of the rock paintings. Scenes of hunters, weapons and ways of hunting are depicted in these paintings. Certain rules were followed in the themes and distributions of the rock paintings of Yinshan Mountains-drawings of wild animals are found mostly on rocks on mountaintops, scenes of hunting generally half way up the mountains while head portraits of gods, celestial bodies and constellations mostly engraved on steep cliffs in valleys or on giant rocks on hillsides by valleys (primitive people believed that gods lived in places of swift currents). These rules are in conformity to the social environment in which the paintings were drawn and the ideologies held by people then. The rock paintings of Yinshan Mountains are plain and vivid in their artistic features and full of rich flavor of life. The rock paintings are mostly based on realistic depictions and present a record of the social life of the childhood and the early historical stages of human beings. Prominence was given to the images of winners in terms of compositions and proportions, creating strong artistic effects. The rock paintings of Yinshan Mountains were drawn mostly by either chiseling or grinding. By chiseling method, metal or stone tools with greater hardness than the rocks were used to chisel and dig tiny spots on the rocks, which were then connected to make outlines of the drawings. Rock paintings drawn by chiseling are uneven in depth and density. The paintings drawn by grinding, also known as abrading, are characterized by deeper marks, polished surfaces and U-shaped sections. Apart from these two methods, there is also the scratching method that produced thin and more superficial lines. Works drawn by scratching are mostly of later periods. Paintings drawn on rocks with the mixture of lime and animal and vegetable oils, known as colored rock frescoes, can also be found. Paintings of this kind are small in number, mostly of the more recent periods and connected with Lamaism. Paintings of the first age are the works of primitive clan tribes of the period from the late Paleolithic Age to mid Bronze Age. Rock paintings in this period are in a period of prosperity with their large numbers, wide distributions and delicate craftsmanship. The rock paintings of the second age are those drawn by the Hans during the period from the Spring and Autumn Period to the Western and Eastern Han dynasties. Rock paintings of the third age are referred to as paintings of the Middle Ages. Paintings of this age can be further divided into two groups---the rock paintings of the Turk from the Northern Dynasty to the Tang Dynasty and those of the Outgoes and the Tangos from the Five Dynasties to the Song Dynasty. The rock paintings of the Turk are small in number and themes mainly with domestic animals with goats in the dominant place. Abstractionism and symbolism were employed as techniques of expression in these paintings. The paintings of the Outgoes are characterized by lines drawn with iron tools, thin and superficial outlines, imitation of preceding works in themes and occasional designs of plants and scripts of the language of the Outgoes. The rock paintings of the Tangos are mostly drawn by chiseling, usually rough in craftsmanship while fresh in color and seemingly new in appearance, with inscriptions of the language of the Western Xia Dynasty. Rock paintings of the fourth age are works of the Mongolians after the Yuan Dynasty and are known as the rock paintings of the recent times. They consist of chiseled paintings and colored ones. The colored rock paintings are unique to the Mongolians. Apart from some themes of the life and production activities (for example, galloping horses, two-humped camels, herdsman, etc. ), most of the paintings are designs related to Lamaism.